Registration is now open for a fantastic upcoming webinar: Chasing Women - Finding Your Female Ancestors. Hosted by Legacy Family Tree's Geoff Rasmussen and presented by GenealogyBlog.com's Leland K. Meitzler, you are in for a real treat. While the live webinar is not until Wednesday, February 16, 2011, space is limited to the first 1,000 attendees, so register today to reserve your virtual seat. Registration is free. Locating the names of our female ancestors can be difficult – principally because their names changed upon marrying. However, women historically haven’t produced as many records as their husbands, since women’s suffrage largely didn’t exist until the twentieth century. This adds to the difficulty of finding their names, let alone the details of their lives. There are two major search areas that we deal with in locating women’s names, the first being the search for their maiden names, and secondly, the search for their married names. One search can be as hard as the other, and you may find you’re doing both types of searches on the same women. This webinar is very “source” oriented, giving detailed information on a wide variety of sources, starting with the obvious, and working its way through sources that you may not have thought of using previously. Leland K. Meitzler founded Heritage Quest in 1985, and has worked as Managing Editor of both Heritage Quest Magazine and The Genealogical Helper. He currently operates Family Roots Publishing Company, writes daily at GenealogyBlog.com, conducts the annual Salt Lake Christmas Tour (now in its 27th year), and speaks nationally, having given over 2000 lectures since 1983. Wednesday, January 5, 2011 - Google for Genealogists with Thomas MacEntee. Have you ever done any FamilySearch Indexing? It is an excellent way to practice reading old handwriting and give back to the genealogical community at the same time. You can learn more about many types of records, develop transcription skills, and work to provide free record indexes all in your spare time. You can see the current projects, as well as some of the completed projects and future projects on the FamilySearch Indexing website. If you are new to indexing you may enjoy Jim Ericson's webinar on "Helping Unlock the World's Records." This presentation covers the purpose of FamilySearch indexing, the benefits of becoming an indexing volunteer, and tips and tricks on indexing records. For experienced indexers there is a second webinar hosted by Legacy Family Tree on "FamilySearch Indexing for Power Users." This presentation by Katie Gale will show you how to simplify and increase your work without decreasing your accuracy. Registration for this summer's Institute of Genealogy and Historical Research (IGHR) will open on Tuesday, January 18, 2011. To prevent an overload of the online registration system, the opening of course registration will be staggered with different courses being opened each hour. A full schedule of the time that each course's registration will be open will be sent out via this list, posted on the IGHR website and IGHR Facebook pages in early January. Note from Angela: Many of the IGHR courses will fill on the first day, so watch the website and plan to be online when the course you are interested in opes up if you really want to attend. I will be doing the same. I am very excited that this blog has been nominated in the "New Blogs" category of Family Tree Magazine's survey of genealogy blogs. I am just getting started with all the ideas I have to write about relating to genealogy education, and appreciate those of you who read my blog. Family Tree Magazine has opened voting for one week only, so vote for your favorite blogs before December 20th. There are eight different categories, and you can vote for five blogs in each one. You can even vote multiple times. The top 40 genealogy blogs will be named in the July 2011 issue of Family Tree Magazine. As the administrator of the ProGen Study Groups I guess it is time that I write about them for this blog. 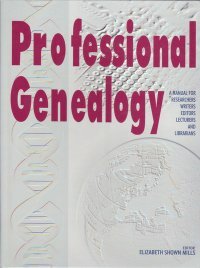 The ProGen Study Program is organized for participants to study Professional Genealogy: A Manual for Researchers, Writers, Editors, Lecturers and Librarians, edited by Elizabeth Shown Mills (Baltimore: Genealogical Publishing Company, 2001). The goal of the program is to help participants develop professional research, writing and business skills. The ProGen study groups are made up of professional genealogists, individuals working to become professional genealogists, and other serious researchers who want to conduct professional level research. Each ProGen group has a coordinator who manages the group, and a BCG certified genealogist who participates as a mentor. It takes many volunteer leaders working together to make this program successful. The study groups are based on a cooperative learning model where everyone works together. Members are expected to be dedicated to the program and make their group a positive learning experience. They are accountable to complete monthly assignments, participate in online group discussions, and provide feedback on the work of others in their group. Each month group members study one or two chapters and then work on a written assignment on the topic. These assignments are designed to refine skills such as writing research plans, analyzing evidence, transcribing documents, writing research reports and formulating proof arguments. On the business side, participants write a mission statement, contract, business plan and marketing plan. For many professional genealogists this is the first time they have taken time to plan out their business strategy. In order to study all 29 chapters of Professional Genealogy, the program takes 19 months to complete. This is a long program, and takes dedication on the part of each participant. Many participants in the ProGen Study Groups also take advantage of other educational opportunities and meet together at genealogical institutes and conferences. This is an opportunity to meet “online friends” in person and network with colleagues from other ProGen study groups. See ProGen events for more information on upcoming gatherings and photos of past events. Once participants have completed the ProGen Study Program they are included on the alumni page of the website. These individuals have shown a dedication to improving their skills, and a commitment to complete the 19 month program. They have given constructive feedback to their colleagues and continue to network with other genealogy professionals. Feel free to use the alumni list when you are in need of a researcher. The first ProGen study group was organized in March 2008 by Lee Anders and a group of enthusiastic genealogists. We wanted to go beyond “reading” Professional Genealogy, and take the time to really study and apply each concept. As others heard about our study group and asked to participate, additional ProGen study groups were formed. I stepped up as administrator of the ProGen Study Program in November 2008. The program continues to grow and gain recognition, and we now have eleven ProGen study groups with over 250 participants from five countries. If you are interested in participating in the ProGen Study Program, please visit the waiting list page to learn of the commitment involved, background experience required,and detailed instructions. The announcement below was posted on the FamilySearch blog. I am very excited about all the new indexes and images FamilySearch is making available to researchers, and hope that you have a chance to use the collection in your research. America's fascination with ancestry is increasing because of the recent television series "Faces of America" on PBS and "Who Do You Think You Are" on NBC. 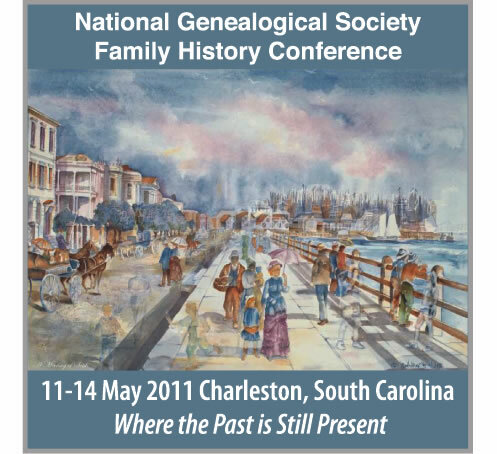 The National Genealogical Society is pleased to announce that registration opens today for next year's conference, which will be held at the Charleston Area Convention Center, 5001 Coliseum Drive, North Charleston, SC 29418, 11-14 May 2011. The Society selected Charleston because of its significance in American history. 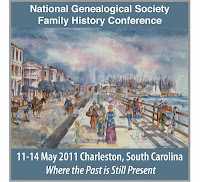 In addition to attending the NGS 2011 Family History Conference, participants will have an opportunity to tour Charleston's historic buildings, churches and homes as well as its many museums and research facilities. The National Genealogical Society anticipates 2,000 genealogists from around the country will attend next year's event. Read more. April 2011 will mark the 150th Anniversary of the beginning of the Civil War at nearby Ft. Sumter, so the four day family history conference will feature talks on both Revolutionary War and Civil War records. More than seventy-five nationally recognized speakers will provide over one hundred and eighty lectures on a wide variety of topics including research in South Carolina and the surrounding states, migration patterns, religious records, research methodology, and problem solving. The conference program will also include lectures about researching various ethnic groups including Germans, Cherokee, African Americans, Huguenots, Irish, Scots, and Scots-Irish. Special Saturday workshops include an all day beginner's workshop, "Genealogy 101: Getting Started with Family History" and a "Kids' Kamp" for children and young adults ages eight through sixteen. An exhibit area with more than one hundred exhibitors will be open and free to the public Wednesday through Saturday including the latest in genealogical software, online research providers and DNA testing services. The Utah Genealogical Association would like to offer a Cyber Monday deal!! Now through Tuesday, November 30th registrants for the Salt Lake Institute of Genealogy will also receive free UGA membership ($35 value) and the UGA member discount ($40 discount) for a total value of $75 off the current price!! Classes are filling fast and will fill even faster with this deal. Register at www.ugagenealogy.com with the coupon code “SLIG2011”. The Salt Lake Institute of Genealogy will be January 10-14, 2011 at the Salt Lake Radisson. Instructors are the best in the nation and cover topics from advanced methodology to writing a family narrative, to technology. We are also offering location-specific courses in French and Irish research this year—don’t wait, we’re not sure when they will be offered again. There is a new Quicksheet available from Elizabeth Shown Mills entitled Genealogical Problem Analysis: A Strategic Plan. One side of the laminated sheet contains the basic premise that tough research problems can be solved with "thorough research, careful documentation, and sound analysis." The information found in sources needs to be analyzed and correlated with other evidence to reach a genealogical conclusion. Mills suggests "10 Steps to a Solution" and shares instructions on how to complete each step. The other side of the Quicksheet contains a "Life Stages Worksheet" listing the typical activities in a persons' life, from birth to burial. There is room to fill in the records found for each activity, and the potential records that could also be searched and correlated. For more information on each of the ten steps, and additional worksheets to complete the analysis process, consider taking Elizabeth Shown Mills' on Advanced Methodology and Evidence Analysis course at the Institute of Genealogy and Historical Research at Samford University. Offering a 10-step solution to genealogical problems, this new QuickSheet will help you leap the proverbial brick wall and save you hours of frustration. The outgrowth of a lifetime of professional experience, the 10 steps provide a systematic basis for problem solving unique to genealogy. When faced with an elusive person or missing or contradictory information, these steps will be your lifeline, helping you to resolve tricky problems related to sources, evidence, and proof. Genealogy books (see my list below). Membership in the National Genealogical Society which includes subscriptions to the National Genealogical Society Quarterly and the NGS Magazine. Membership in your local or state genealogy society. Registration for a national or local genealogy conference. Registration for an online genealogy course. Subscription to a genealogical journal or magazine. Edited by Loretto Dennis Szucs & Sandra Hargreaves Luebking. Provo, Utah: Ancestry, 2006. Marsha Hoffman Rising. Cincinnati, Ohio: Family Tree Books, 2005. The Board for Certification of Genealogists. Orem, Utah: Ancestry, 2000. Edited by Anne Bruner Eales and Robert M. Kvasnicka. Washington, D.C.: National Archives and Records Administration, 2000. Edited by Alice Eichholz. Provo, Utah: Ancestry, 2004. I received the following announcement from Beth Ashmore at Samford University Library. If you are employed by a library and would like to attend the Institute of Genealogy and Historical Research then this is a great opportunity to have your tuition paid by scholarship. Applications for the Jean Thomason Scholarship for IGHR are due by December 1, 2010 and will be reviewed by a Samford University Library committee. The winner will be announced in January. Or email it to jszurek@samford.edu with the subject line "IGHR Scholarship"
In honor of Veterans Day I am highlighting online educational options for military records. Learning more about ancestors who served in the military is a way to honor them, and also a way to find valuable genealogical information. Military pension files from the Revolutionary War to the Civil War are among my favorite genealogical records. There are several lectures on military records that have been recorded and are available to view as free online presentations. For a more in-depth study, there are also two online courses available. While I have viewed several of the video presentations, I have not taken the courses. With so many military conflicts throughout America’s history, it’s likely your ancestors were involved. Finding records of their service will help you round out the portraits of their lives and honor their memory. Military files also can reveal information about widows and children—and even ancestors who didn’t serve might have left behind draft records. This course will teach you what to look for and how to locate the records you seek. Within this course there is discussion of the various types of records created by military service, such as service records, muster rolls, pension records, and draft registration. The content of the records and their usefulness for genealogy and immigration research is described. Records of conflicts of the United States and colonial America from the early colonial wars of the seventeenth century to the Second World War are included. The Army, Navy, and other branches of service are detailed. History of military action in America as it relates to records is also included. Give Thanks for Your Family This Holiday Season! Learn more about them with a course from Family Tree University. Register for any upcoming course and save 25%. Enter coupon code THANKS10 when you register. Building on our course Find Your German Roots: From America to Deutschland, this class focuses on skills German researchers need to dig deeper into their families’ pasts. You’ll learn tricks for reading German script and type, what the Family History Library system can contribute to your research, and how to track down German ancestors who lived outside of today’s Germany. “There is no truth without proof.” Successful genealogists abide by this, and it will be your new motto after this course. Knowing how to accurately cite your sources helps you work smarter and faster, gives your research credibility and helps you bust down brick walls. This course will focus on the Evidence! style of citation, the one most commonly used by genealogists. When you’re a family history newbie, the prospect of diving into your roots research can seem overwhelming. This course will start you on the fun and rewarding journey of discovering your roots. Learn how to begin, where to look for information to extend your family tree, what to do with what you find and how to put it all together. Go beyond simple web searches and take advantage of Google’s other built-in tools, which can be just as helpful for family tree research. This course will explore four of the tools best suited to help you with your genealogy: News Archive and Timeline, Book Search, YouTube and Google Earth. When we first begin researching our family tree, we’re taught that we should start with ourselves and work backward. Starting at the end of someone’s life and working backward is the most efficient and accurate way to research—in most cases. But two genealogical challenges call for a change in strategy: overcoming brick walls and finding living relatives. Ben Franklin said the only things certain in life were death and taxes—genealogists can add paperwork to that list. When our ancestors passed, many records were created in their wake. This course will explore death records and related sources, including wills, obituaries, funeral home records, burial permits and coroner reports. You know you’ve been bitten by the genealogy bug when cemeteries cease to be creepy and turn into a place you can spend hours. Cemetery Research 101 will get you excited about exploring the final resting places of your ancestors and give you the knowledge you need to read tombstones, decipher plot maps and keep your research organized. Newspapers are essentially a time capsule for your ancestors. Papers can provide clues to major and minor events in your ancestor’s life through obituaries, social columns, birth announcements and other news stories. In this class you’ll learn how to find and use newspaper archives—online, on paper and on microfilm—to put together missing pieces of your genealogical research. Poland’s long history is fraught with border changes, ethnic strife and an ongoing quest for autonomy. If you’re among the more than 9 million Americans with Polish roots, we’ll help you find your Polish ancestors by debunking myths, explaining history and pointing you to the most useful records. A successful genealogist often ends up with an embarrassment of riches: too much information in too many places. Whether you work on paper or do everything online, getting your research organized is essential to keeping track of ancestors and making sure you know where to put new ones in your family tree. This course will rescue you from unhelpful habits and get your workspace—virtual or physical—tidy again. Photography is an essential tool for genealogists—not only for capturing family memories now, but also for preserving old documents and heirlooms. This course will help you master the basics of using digital cameras, photo editing software and scanners in your genealogy work. You’ve worked hard to uncover your family’s history, and you want to preserve your research in a form that will stand the test of time—a keepsake book that can be shared today as well as archived for future generations. If you’ve ever thought such a project was too overwhelming or that you had to complete you research before you could create your book, this simply isn’t true. Family history books come in all flavors, from collections of family recipes to compilations of oral history interviews. This course will show you how to make the process manageable and enjoyable from start to finish. Conducting research on African-Americans ancestors is a challenging proposition and one must use all the available resources. Newspapers can provide a critical link to research success once the genealogist learns some important general knowledge along with a few essential skills. This course will equip you with key background information for newspaper research, expose myths pertaining to the use of white newspapers, give you the skill and confidence to seek out and utilize African-American newspapers, and furnish you with invaluable tips and strategies designed to optimize your success. City directories are indispensable tools for genealogists, but they go far beyond just listing your ancestor’s address. They connect an ancestor to a certain place in time and lead to a multitude of sources and present a fuller picture of your ancestors’ lives. In this course, we’ll explore city directories and their applications so you can fully take advantage of this comprehensive source. Many people get interested in genealogy because they want to learn more about where their family came from—specifically, to find out which ancestors came over from the “old country” and when. This course will teach you how to identify an immigrant ancestor in your family tree. You’ll learn how to pinpoint when and where he or she left and locate records documenting his or her immigration. Each of the four lessons includes an assignment designed to help you progress in your research of an immigrant ancestor. After you’ve identified the immigrant in your family tree and pinpointed the place your family came from, you’re ready to begin exploring resources in the country. The third course in our immigrant research series walks you through the steps to successfully cross the pond and find your family in foreign records. The story of your own or your family’s history is likely to be the most personal, emotionally satisfying and overwhelming writing project you’ll ever undertake. You’ve collected oral histories, personal memories, journal entries, photographs, letters and countless other documents—now find out how to weave them together into a compelling story. In this course, you’ll work with a published writer to craft an outline for your book and start putting your family’s legacy down on paper. "Choosing the Best Continuing Education Opportunities"
Elissa Scalise Powell, CG gave a presentation on "Choosing the Best Continuing Education Opportunities" at the APG Professional Management Conference on August 17, 2010. FamilySearch video taped the presentation and has made it available on the research courses page of their website. Elissa Powell shares details on all types of programs such as: university courses, genealogy conferences, institutes, self-guided study, virtual peer group study, and on-line offering. She encourages taking a self-assessment to determine your educational needs and which type of program would be best for you. In addition Elissa covers money saving tips and scholarships available. Along with the video presentation Elissa Powell and FamilySearch have made the handout for this presentation available. The handout covers descriptions of many genealogy education programs, list of scholarships available, and a self-assessment for evaluating your educational needs. It also includes a two page chart comparing educational programs on experience level, cost, instructional type, length of time, and format. "This lecture will present various options for continuing genealogical education and will show examples from each program. University courses, conferences, institutes, self-guided study, virtual peer group study, and on-line offerings will be highlighted. The pros and cons of learning styles, price, availability, time commitment and guidance discussed and compared. Attendees will achieve a better understanding of each type of study and will be able to evaluate which they want to pursue further in creating their own continuing education plan." I attended a live webinar last Saturday with Karen Clifford, AG speaking on "Evidence Analysis." Karen was speaking live at the ICAPGen (International Commission for the Accreditation of Professional Genealogists) annual seminar in Salt Lake City, Utah, and simultaneously to a live online webinar audience hosted by Legacy Family Tree. I thought this presentation was excellent, and fortunately is is archived and available for others to view on the Legacy archived webinars page. Karen was speaking to an ICAPGen conference audience, and some of her remarks were geared toward the 3 hour ICAPGen examination, but her ideas are not limited to that situation. She shared useful suggestions emphasizing analysis of documents and evidence throughout the research process. Karen covers terminology and then gives a case study illustrating how to apply the techniques she suggests. Her process includes elements such as analyzing the problem, organizing your data, brainstorming steps to a solution, conducting the research, recording your sources, comparing records, reaching a conclusion, and explaining your proof. In this webinar you will hear Karen's voice and see her power point slides. This presentation is one hour eleven minutes long, and will be online until November 23, 2010. I suggest that you take time to view it while it is available.